Please note that performing missions is only possible if there are opponents in a battle: other players in DM or enemy team players in CTF, TDM, CP, ASL, RGB, and JGR. Also note that PRO battles do not count towards your missions. Every day, upon first entering the game, you will be presented with a window containing the 3 daily missions you should perform to earn your in-game rewards. You can only complete up to 3 daily missions per day. Daily missions are available from the rank Recruit or higher. You can check your progress on the "Missions" screen in the game. Your current missions can be exchanged for new ones. You can exchange one mission for free once a day, and for a number of crystals any number of times after that. A mission always gets replaced with a mission of a different type. The price for exchanging a mission is equal to a fifth of the crystal reward you would get for completing it at your current rank, from 60 crystals at Corporal to 840 at Legend. Daily Bonus (given to Premium tankers only). 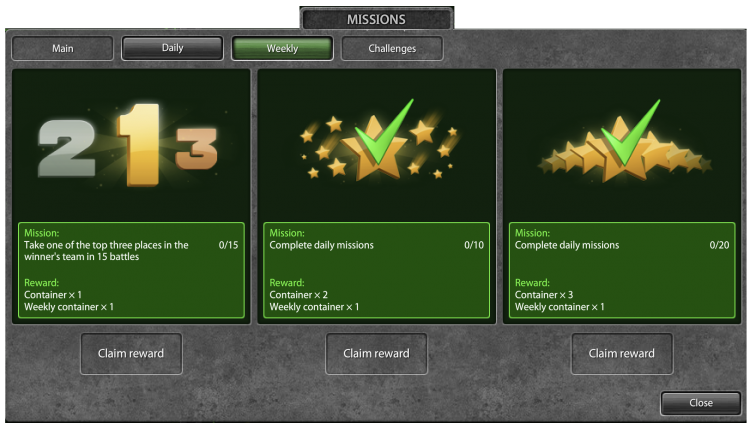 1st Weekly Mission: This mission will be one of the types of daily missions, but with an increased difficulty. 2nd Weekly Mission: Complete 10 Daily Missions. 3rd Weekly Mission: Complete 20 Daily Missions. Note that the progress of the previous weekly mission (i.e complete 10 daily missions) will still count towards completing this mission. These are special containers that can only be obtained as a reward for completing Weekly Missions. Received Weekly Containers are stored in the Garage under the "Special" tab, and they can be opened from within it. Weekly containers contain only supplies and crystals. The size of the rewards depend upon the rank of the player. Upon opening a weekly container, the player will receive all the prizes for his/her as displayed in the table below. Description: "Earn battle score in battles"
Description: "Finish battles in any mode"
Note: Bonus reward from Premium Account does count towards this mission. Goal: player needs to finish in the top three places on the winning team in any battle mode or map. This includes being top three in a DM or JGR battle. Description: "Take one of the top three places in the winner's team"
Note: As with the rest of the missions, this mission requires at least one enemy player to be present in the battle. Collecting boxes in an empty map will not count towards the mission. Description: "Use overdrive in battle"
Note: Receiving an Overdrive from an ally does not count towards the progress of this mission. Note: This mission is a Weekly Mission and thus cannot be changed for crystals. Additionally, it will only appear under the 'Weekly' tab. This page was last modified on 9 February 2019, at 11:44. This page has been accessed 740,369 times.